Mario Cart is an interesting racing game. This game has unique 3D graphics, suitable for all ages. You can experience this game on your browser because it is a flash game. 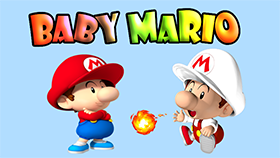 In this game you will control Mario and play against Luigi, Wario, and Waluigi. Your task is to win all the races. Career Mode: You will play against 3 opponents in 4 tracks. Single Race Mode: Same as Career Mode, but you can select the race map in this mode. Time Trial Mode: You will race against yourself and your mission is to run as fast as possible. Interesting points in this game are the items on the track. These are the mushrooms that help you speed up, or the bananas will slow down your speed. Use ESC or Enter to pause. There are Easy - Normal - Hard and Very Hard modes for you in Carreer.